One of the main doctrines of The Church of Jesus Christ of Latter-day Saints is the Plan of Salvation. This plan, also known as the Plan of Happiness or the Plan of Redemption, details our journey before, during, and after our time on earth. We lived as spirit children of our Father in Heaven before we were born on this earth. We were not, however, like our Heavenly Father, nor could we ever become like Him and enjoy all the blessings that He enjoys without the experience of living in mortality with a physical body. Because of His desire for us to be like Him, God created a plan: The Plan of Salvation. God created this plan because He wants us to have eternal life with Him. Before coming to live on earth, we were with God, in our pre-mortal existence. It was during this time that the Plan of Salvation was created, and presented to us. The goal from the beginning was to progress to be like Our Father, who is a glorified, perfect, resurrected man of flesh and bone. God knew we wouldn’t be able to become like Him without His help. His plan included a Savior to meet the demands of justice when we fail, and enable mercy to make just people perfect. Most of God’s children loved the plan, and the idea to come to earth to gain knowledge, form relationships, and develop faith. However, Satan, or Lucifer, did not agree with God’s plan. He presented his own plan in which he promised to save every soul through the destruction of man’s agency. Not only would Lucifer have not been able to achieve this boastful claim, but this plan would defeat the purpose of coming to earth to learn and gain experience. God chose Jesus Christ to be the Savior and Redeemer of His plan. It was always meant to be that way, as Jesus was the chosen Savior from the start. As you can probably imagine though, Lucifer was pretty upset. Lucifer rebelled against God, and 1/3 of the souls in heaven chose to follow him in his rebellion (Doctrine and Covenants 29:36). We know, just by the fact that we are here on earth, that we chose to follow God’s plan, because those souls who followed Lucifer will never come to earth and receive a body. 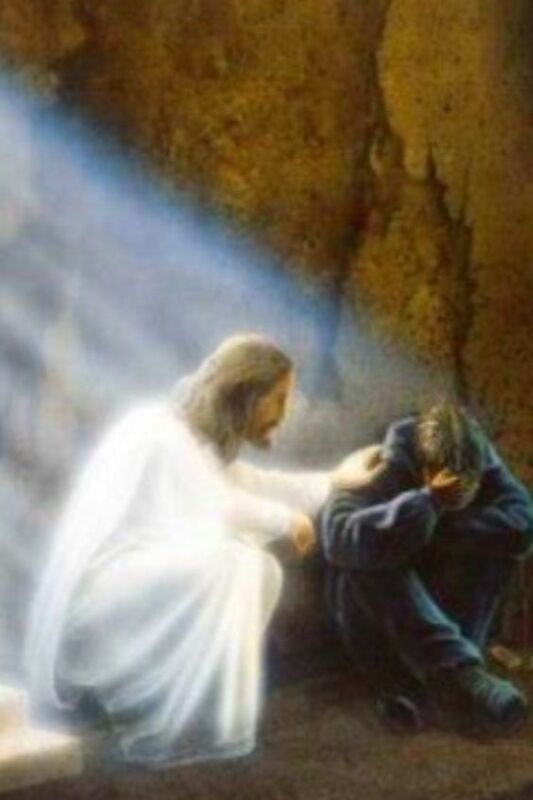 Jesus Christ comforting a man. The veil assists us in forgetting our time before earth and prevents us from witnessing miraculous things here on earth. This is actually for our benefit, as backward as that may sound. What would be the point in coming to earth, and having faith in God, if we knew for a surety that God was real? How could we truly be tested on our ability to love God, and follow his commandments if we could look outside our window and see literal angels doing God’s work? There would be no challenge. We wouldn’t learn or grow. Salvation is a process, as well as a goal. Salvation involves growth, development, and change. That process implies that in mortality we must learn capacities and skills, not merely pick up information. There is something about forcing people to be righteous that interferes with, even prohibits, the process that righteousness in a free environment is designed to enable. Righteous living causes something to happen to people. We needed to acquire skills, and have experiences that we could only obtain through living on earth, without the sure knowledge of God. The next part of the Plan of Salvation is for us to come to earth, gain a body, and live our lives in a righteous manner. The Lord will grant unto these children [who pass away before the age of accountability] the privilege of all the sealing blessings which pertain to the exaltation. We were all mature spirits before we were born, and the bodies of little children will grow after the resurrection to the full stature of the spirit, and all the blessings will be theirs through their obedience, the same as if they had lived to maturity and received them on the earth. 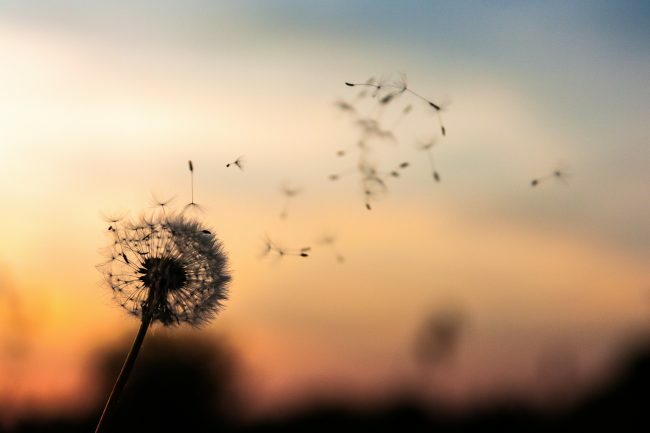 As for those who do live long enough to experience life, some seem to experience a life full of devastation, yet others seem to breeze through without breaking a sweat. However, we know from the scriptures that we will never be expected to bear any trial that is too much for us to endure if we call upon God for help (1 Corinthians 10:13). We can be sure that even when life is not an equal test, it is still a fair test, if only because the one who grades the test is absolutely fair. Our Heavenly Father knows both us and our trials perfectly. He will weigh all this and judge us righteously. Our time on earth is not meant to be easy. This is our time to learn difficult lessons and experience things we wouldn’t have been able to in the pre-mortal life. But as long as we do all we can to follow God’s commandments, and repent as necessary, we can be assured we will attain glory in our post-earth life. There is a saying my brother once told me, “The only thing we have to do in life is die.” As morbid as that sounds, there is some truth to it. Death is a part of life that we will all eventually experience. Paradise is that part of the spirit world in which the righteous spirits who have departed from this life await the resurrection of the body. It is a condition of happiness and peace… [Spirit paradise is] reserved for those who have been baptized and who have remained faithful. Spirit prison [is] a temporary place in the postmortal world for those who died without a knowledge of the truth or those who were disobedient in mortality… Spirits will be taught the gospel and have the opportunity to repent and accept ordinances of salvation that are performed for them in temples. Those who accept the gospel may dwell in paradise until the Resurrection. Members of the Church don’t have clear definitions of the exact nature of spirit paradise and spirit prison. However, we have been taught that we will maintain the same opinions, mindset, and even addictions, in the spirit world that we have on earth at the time of our death. Because of this, the spirit world can feel very punishing and prison-like to those who were not righteous on earth. The spirit world will be a paradise or prison of our own making. To be resurrected is to have your body and spirit reunite, after death, in an immortal state. In this immortal state, your body will be perfect; it will be free from pain, disease, and death. Resurrection does not happen for everyone at the same time. In fact, there are some people who are already resurrected. Parley P. Pratt talks about the three general resurrections in his book, Key to the Science of Theology. From Pratt, we are taught that of these three resurrections, one has already taken place. The first general resurrection included Jesus Christ, who was the first person to be resurrected. Also included in this resurrection, as taught by Pratt, were those “from Adam down to John the Baptist” who were faithful and died before Christ’s resurrection. The second general resurrection (often referred to as the first resurrection which unfortunately can be very confusing) is currently in action, and will continue on when Jesus Christ comes to earth for the Second Coming. This is taught to us by James E. Talmage, in his book, Articles of Faith. As for the Second Coming, we know through the scriptures that no one, save God only, knows when it will happen (Matthew 24:36, Doctrine and Covenants 49: 7). Over a thousand years later, the third general resurrection will, finally, take place. Those who were not a part of the previous resurrections will be included. The afternoon of the first resurrection will be for those were taught the gospel in spirit prison, and accepted it (Doctrine and Covenants 88:99). McConkie has also taught us that this part of the first resurrection will actually take place after the millennium has started. After the 1,000 years end, Satan will be unbound for a short time (Revelation 20:1-3). Then is the time when their torments shall be as a lake of fire and brimstone, whose flame ascendeth up forever and ever; and then is the time that they shall be chained down to an everlasting destruction, according to the power and captivity of Satan… They shall be as though there had been no redemption made; for they cannot be redeemed according to God’s justice; and they cannot die, seeing there is no more corruption. This part of the second resurrection will take place at the end of time on earth (Doctrine and Covenants 88:100-101). Eventually, the day will come when we will stand before God, through Jesus Christ, and be judged for our sins. Everything you have ever thought, said, or done will be evaluated. That Day of Judgment will be a day of mercy and love—a day when broken hearts are healed, when tears of grief are replaced with tears of gratitude, when all will be made right. Depending on how we are judged, we will obtain a certain degree of glory to live in for the rest of our eternal life. The celestial kingdom is reserved for the most righteous. It is often related to being as glorious as the brightness of the sun. 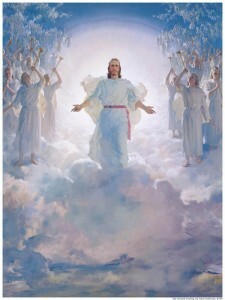 It is here where the righteous will live eternally with God the Father, and His Son, Jesus Christ. The Church’s website teaches us that, “to inherit this gift, we must receive the ordinances of salvation, keep the commandments, and repent of our sins.” These are the basic requirements for entering the celestial kingdom. Doctrine and Covenants 76:50-70 goes into more detail about who will be permitted into the celestial kingdom. Some people will live life without the knowledge of the gospel. However Doctrine and Covenants 137:7-9 teaches us, “For I, the Lord, will judge all men according to their works, according to the desire of their hearts.” As long as someone is of open heart and mind, and would have accepted Jesus Christ and his gospel, they will be saved. Joseph Smith has taught us that there are three degrees of the celestial kingdom. To enter the highest degree, you must be married through the new and everlasting covenant of marriage. Everyone will have the opportunity to be married, either in this life or the next. 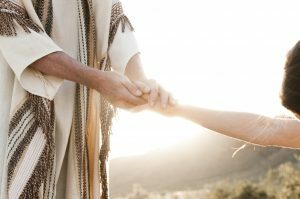 Yes, it is true that people don’t get married in heaven, since marriage is an earthly ordinance. However, marriages will be performed by proxy in temples on the earth, so that those who are worthy of celestial glory and desire marriage can have it. Those who enter this kingdom will include people who were moral, and respectable in life, but were led astray. It will also include those who did not accept the gospel in this life, but did accept it in the spirit world. 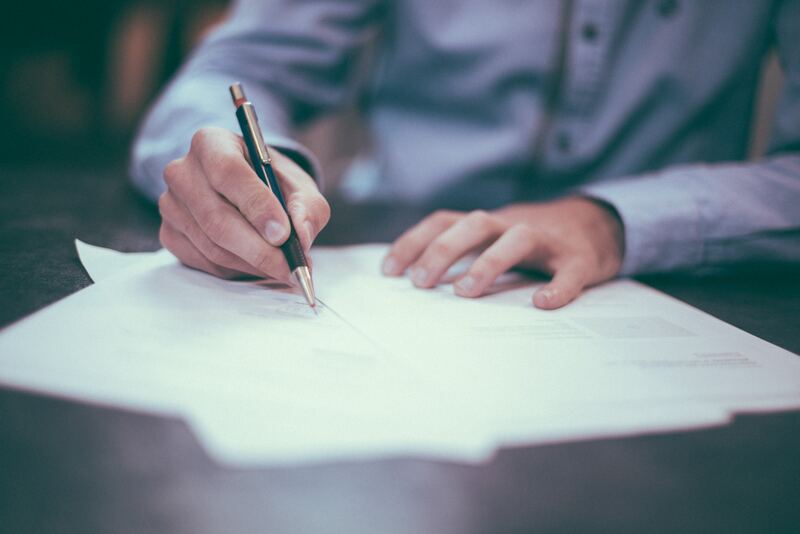 Doctrine and Covenants 76:71-80 goes into more detail about who will be permitted into the terrestrial kingdom. The Terrestrial Kingdom is a kingdom of great glory. The telestial kingdom is the degree of glory for those who did not accept the gospel of Jesus Christ in this world or the next. This kingdom is reserved for those who are resurrected in the last resurrection. Doctrine and Covenants 76:81-90, 98-106, 109-112 goes into more detail about who will be accepted into the telestial kingdom. 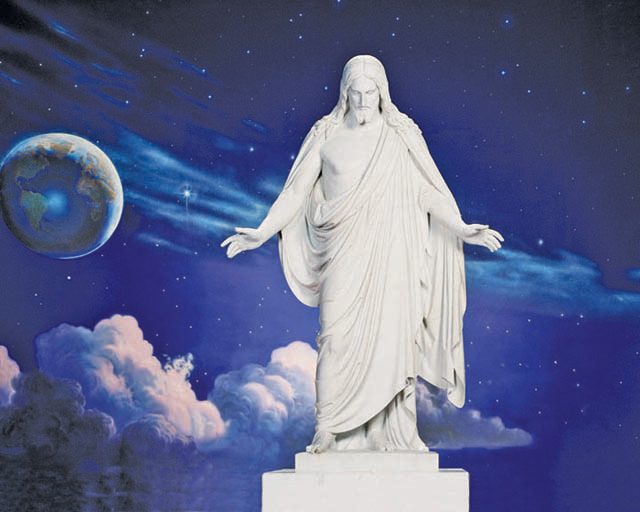 Although people who inherit this kingdom may have denied Christ on earth and in the spirit world, and have had to suffer for their owns sins temporarily, this kingdom’s glory is “beyond all description.” Thus, Mormon doctrine is the most inclusive of any existing Christian faith. Even those who reject Christ can inherit a kingdom of glory in heaven, as long as they don’t qualify for Outer Darkness, described below. Receive the Holy Ghost, have the heavens opened unto him, and know God, and then sin against Him… He has got to say that the sun does not shine while he sees it; he has got to deny Jesus Christ when the heavens have been opened unto him, and to deny the plan of salvation with his eyes open to the truth of it. Doctrine and Covenants 76: 30-49 goes into more detail about who will be taken down to Outer Darkness. People who go to Outer Darkness are called Sons of Perdition. Satan and his follower from pre-mortal life will be consigned there. Jesus Christ holding a lamb. 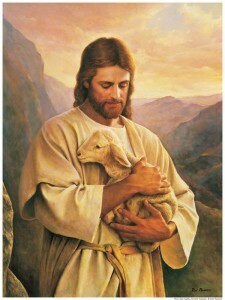 Symbolically, Christ is the Shepherd, and we are his sheep. The Plan of Salvation is a beautiful, glorious plan. However, none of it would be possible without our Savior and Redeemer, Jesus Christ. It is through Him, and of Him that we can be saved. Jesus Christ lived a perfect life, atoned for our sins, and made it possible for us to return back to our Father in heaven. Don’t settle for something less than your potential because it’s easier, or more exciting, or popular. Take the time to really think about what you want, and what’s at stake. I am literally talking about your eternal life here. 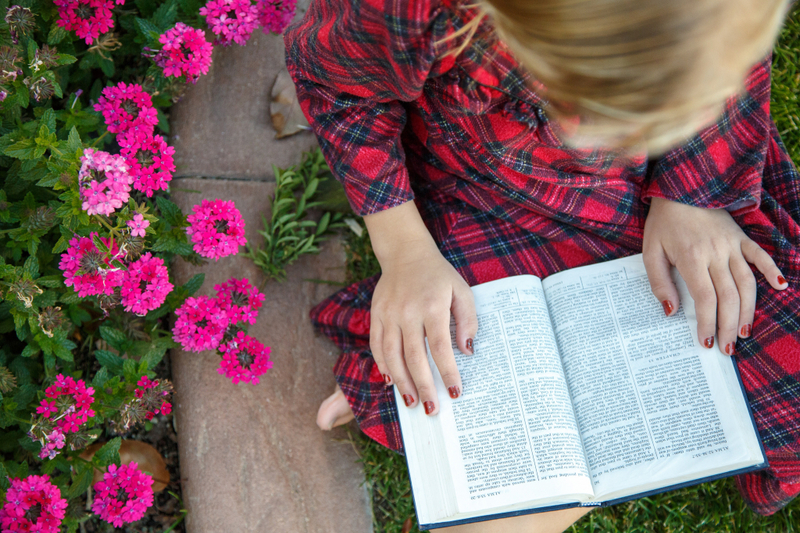 If you don’t believe in the Plan of Salvation, study it. Ponder it with an open mind. If you’re the praying type, pray about it. If you aren’t the praying type, pray about it anyway. This plan is real. This plan is true. Jesus Christ is our Savior, and through Him, we can live with our Father in heaven again.